Wee Lil' Blog: Knickernappies Winner and New Giveaway! Knickernappies Winner and New Giveaway! The winner has been contacted and has 48 hours to respond and claim her prize. Congratulations! For your mandatory entry this month, you'll need to do two things. First, go add yourself as a follower of this blog. Did you do that? *waits a moment* Good! Now in a comment, tell us, "Are you hoping for any diapers this Christmas? Which ones?" i havent thought about diapers for christmas...but maybe! 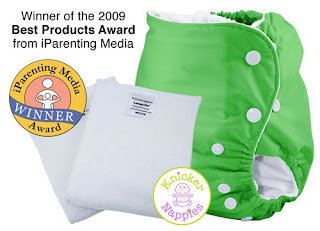 I'm a cloth diapering newbie, on my third and final baby :) I have like NO experience, so I'm looking forward to ANY fluffy goodies we get for Meadow for Christmas this year! I'm a follower, and no, I'm not really expecting any diapers for Christmas. It's kind of my personal hobby, and I've slowly been collecting my stash on my own. Sad but I'm not expecting any new diapers for the holidays (we're Jewish so it wouldn't be for Christmas...). Tight budget means no more spending on anything, let alone diapers!! I'd love to win this!! I have asked for gift cards for Christmas so then I can pick out a few diapers! I would love to try a Charlie Banana or an Incredibum or maybe add another AppleCheeks to our stash! I follow you on GFC and would love the new Einstein print for BG 4.0s. Hoping for diapers for Christmas, but doubtful I will get any from family. Nobody seems to understand why we are using cloth diapers...sigh and argh. Follow Knickernappies on FB as Lily Munoz Ivey. GFC follower (Samantha) And I actually already got one diaper for my LO for Christmas. It's a Little Bee Co. bamboo diaper. I'd love to get one of the holiday print tots bots too though! I would love a new 4.0 for Christmas! i would love any diapers for christmas! we dont have black or brown yet. I hope I get diapers for Christmas but will probably have to wait till after for our tax return. I really want to try an Itti Bitti tuto or Grovia. I am following via GFC. I am hoping for an all in one diaper this Christmas. #1. Following Wee Little Changes publicly. #2. Following Wee Little Changes publicly. #3. Following Wee Little Changes publicly. #4. Following Wee Little Changes publicly. I follow via GFC as Jeniffer Smith. I fan Knickernappies as Jeniffer Sheriff Smith on FB. I follow your blog through google friend connect. I didn't ask for any cloth diapers for Christmas, but I would love if someone surprised me with either newborn sized diapers or a couple good diaper covers. I just took inventory of the stash I'm building for our baby girl due in February and those areas are seriously lacking! I would love any diapers for xmas! I am a knickernappies fan on FB as Jessica Sapalio. I am a WLC fan on FB as Jessica Sapalio. I follow the WLC blog as Jessica Sapalio. I follow the knickernappies blog as Jessica Sapalio. I'm always hoping for diapers! Maybe some softbums. I follow knickernappies on FB as Jessica Sapalio. I am a Wee Little Changes FB fan as Jessica sapalio.